Peter McGrath has told his Fermanagh players that they can be a force at All-Ireland level for several years. McGrath has guided the Ernemen to a surprise place in the last eight of the All-Ireland Championship where they will face favourites Dublin on Sunday. The Erne boss knows his team will face a "huge task" but says he is managing a team that "ticks all the boxes". "If they keep at it, I think Fermanagh will be there or thereabouts for a number of years to come," he said. "There is a panel of players in place now that are capable, committed, talented and who tick practically all the boxes that are needed to be a serious gaelic football team. "We need to hold that together and push on for what's left of this season and go hard at it again next season." 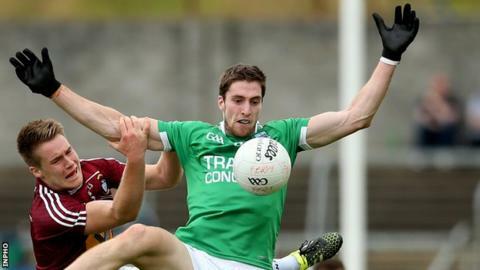 McGrath's side recovered from the first-half black carding of key defenders Marty O'Brien and Ryan McCluskey plus the injury suffered by midfielder and captain Eoin Donnelly to run out conclusive 1-13 to 0-7 winners over Westmeath in the final qualifiers round on Saturday. The Fermanagh boss said his side's latest display emphasised the resilience and quality in the current Erne squad. Twice All-Ireland winning manager McGrath is receiving huge plaudits for his achievements with Fermanagh this season but the Down man says his job is being "easy" by the attitude of the players. "They are exceptionally committed and talented and they have worked so hard since last October. "There is a very, very strong team ethic within the group and a very strong spirit. "They have shown enormous character through this campaign. "When all those things are there, leading them becomes not only a relatively easy task, it becomes a pleasure. "That's why maybe they are getting the best out of me and maybe my management team is getting the best out of them." The one negative from Fermanagh's latest win was the hamstring injury suffered by skipper Donnelly and he has to be regarded as a major fitness doubt for Sunday's Dubs game. "Eoin felt he couldn't go because of his hamstring on so we had to take him off. "With hamstring injuries, the picture doesn't tend to become clear for around 48 hours so we're not really sure about his situation at this stage," said McGrath on Monday. "He is a very, very influential player for us. He's our team captain and plays with high energy but also has great calm and focus."